During the winter months, there's a beautiful winter wonderland out there. But if your windows are all fogged up - covered in condensation - you're missing out on the beautiful scenery. Even if there's no great view out your window, the moisture from the condensation usually brings with it a bunch of ugly and unhealthy mold that ends up on your window sill. Wouldn't you rather see the winter scenery outside your window? 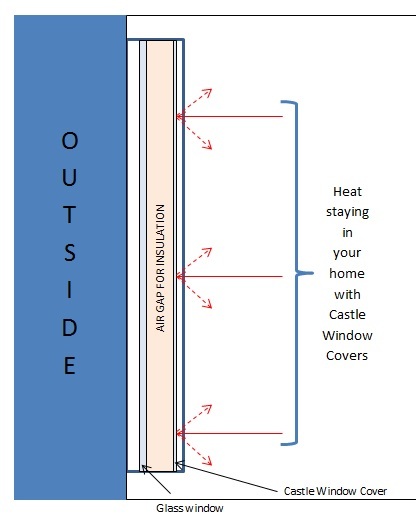 Insulating your windows will help eliminate condensation and window mold. Without boring you with all kinds of complex scientific nerdiness, in general, window condensation happens in the winter when your windows aren't properly insulated. Remember that glass is a conductor of heat, just like metal. During the winter, when you turn on the heater, that hot air tries to get out through your glass windows. 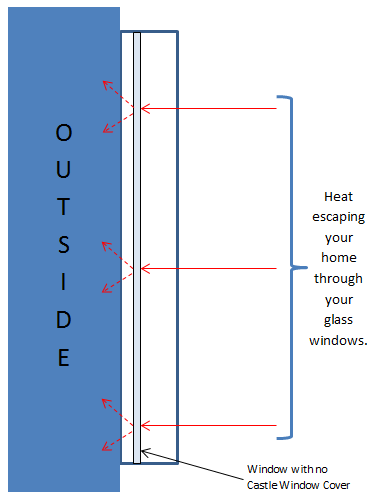 While the hot air clings to the glass in your windows, the cold air on the other side cools it. This creates water vapor, and that turns into window condensation... and that ruins the view of the winter wonderland outside. Insulating your windows with Castle Window Covers virtually eliminates window condensation. This also helps prevent window mold: that annoying mold that grows around your window frame and on the window sill. When the window condensation drips and runs down the window and onto the window frame and window sill, it settles there and allows that disgusting mold to grow around your windows. Not only is it unsightly, it's also unhealthy. Installing Castle Window Covers to insulate your windows not only reduces energy costs and soundproofs your windows, they also virtually eliminate all window condensation and mold around your windows. When heat contacts your cold windows in the winter, this causes the water to vaporize and leave condensation (and mold) on and around your windows. By insulating your windows with Castle Window Covers, the heat stays away from the cold, glass window, virtually eliminating the chance for condensation and window mold.